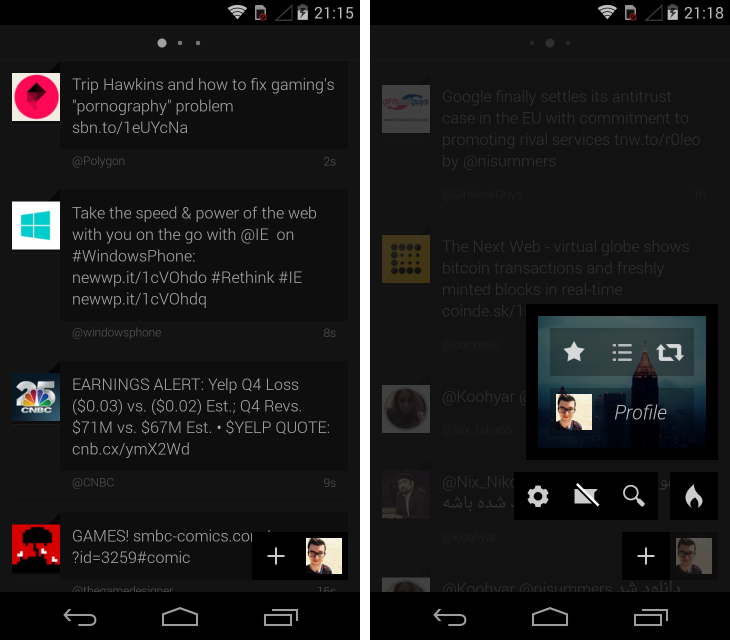 Twitter’s official Android app can feel bloated and unintuitive. The Discover and Activity tabs are given prominence at the top of the screen, but it’s difficult to know exactly what it’s showing you. Mentions have been absorbed into a new area called Notifications, which also include favorites and retweets by default, in addition to the usual inbox for direct messages. It’s not unusable, but many longtime Twitter users (myself included) often feel like they’re fighting against the app, rather than with it. If you feel the same way, we’ve put together a shortlist for our favorite third-party alternatives. TweetCaster Pro doesn’t do much for me in the design department. The icons that lead to your mentions, direct messages, favorites and lists at the top of the screen look uninspired. Some of the themes are pretty garish and parts of the app feel overcrowded and poorly spaced out. Nevertheless, I love TweetCaster Pro for its reliability. The app is surprisingly nippy and unlike Twitter’s official Android offering, it doesn’t try to hide the information that you want behind ambiguous labels such as Discover and Activity. Mentions and direct messages are clearly signposted, and it’s easy to look up trending topics and new people to follow when the need arises. 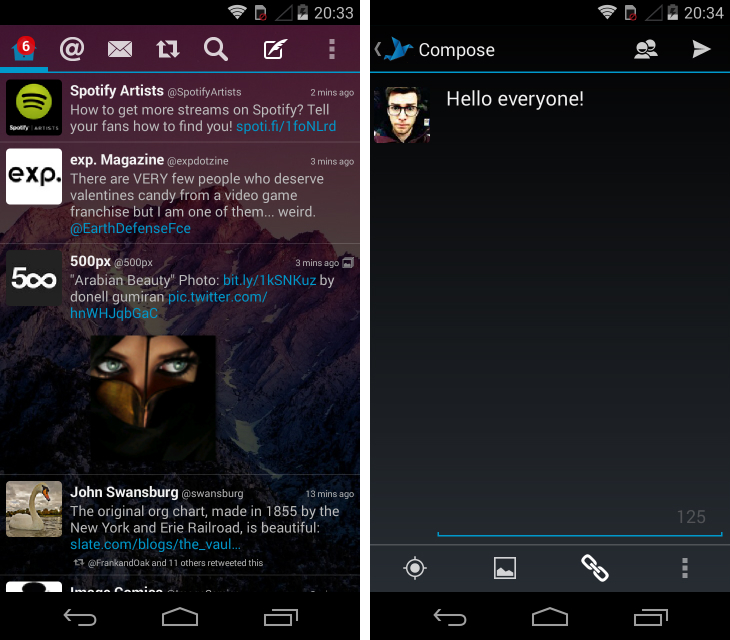 Better yet, TweetCaster Pro offers a wealth of customization options. In addition to multiple themes, you can set the font size, the color of tweets that mention your account, auto-refresh intervals, background notifications and more. All of these settings, combined with its hands-off approach to the core Twitter experience, make this a great choice. Note: A free version of this app is also available, but is supported with ads. 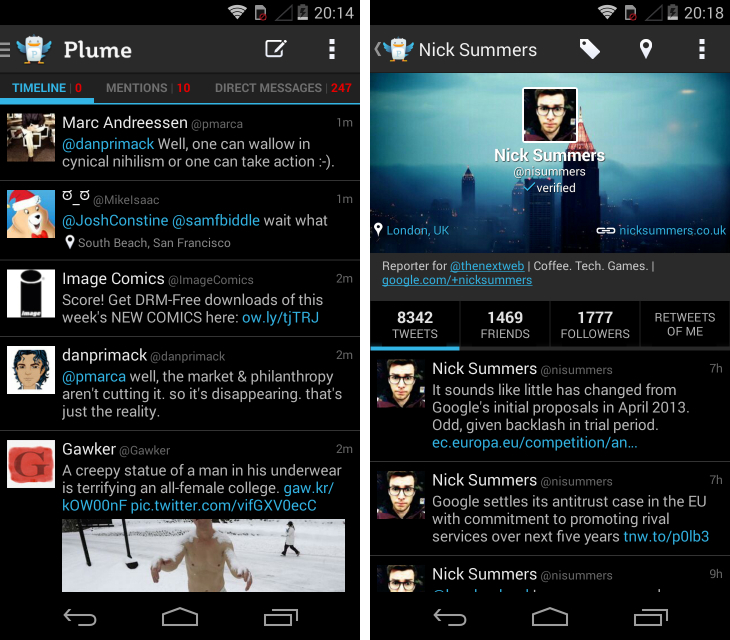 Plume is a no-nonsense Twitter app with a straightforward design that you can wrap your head around in about 10 seconds flat. Tweets are displayed in vertical feeds which you can jump between by swiping across the display on your smartphone or tablet. It’s a common gesture for Twitter apps, but it works well when you want to quickly open the app and check everything that’s come in. Alternatively, there are tabs at the top of the screen that let you quickly switch to your timeline, mentions and direct messages. Next to each header is a number that denotes unread tweets or messages, and you can quickly jump to the top of a column by tapping on the tab while you’re within the same feed. A menu that slides out on the left-hand side gives you access to search, favorites, lists and other connected Facebook and Twitter accounts. The search offering is a little basic and I found reviewing retweets from my profile page was unintuitive, but they’re small knocks on what is otherwise a very well-made app. Modders will also appreciate the vast customization options, which allow you to tinker with its appearance, notifications and streaming mode. Falcon Pro disappeared from the Google Play store a while back after hitting its token limit; Twitter gives developers access to a finite amount (which are needed to accept new users) to cap the growth of third-party apps. However, it’s still possible to get this app online. Just navigate to the developer’s website, download the .apk file and run through the subsequent installation process. To get past the token requirement, just tap the Falcon logo, followed by the four corners of the display. Once all the colored shapes have appeared, toggle the orange square off and shake your phone for a moment. Next, you’ll need to head to dev.twitter.com, sign-in with your Twitter account and hit the My Applications drop-down in the top right-hand corner. Create a new app and add literally anything to the subsequent text fields. Once you’re done, go under settings and tick the last check-box under Access. Finally, grab your consumer key and secret from the OAuth tool, jump back across to Falcon Pro and enter them in the corresponding log-in fields. 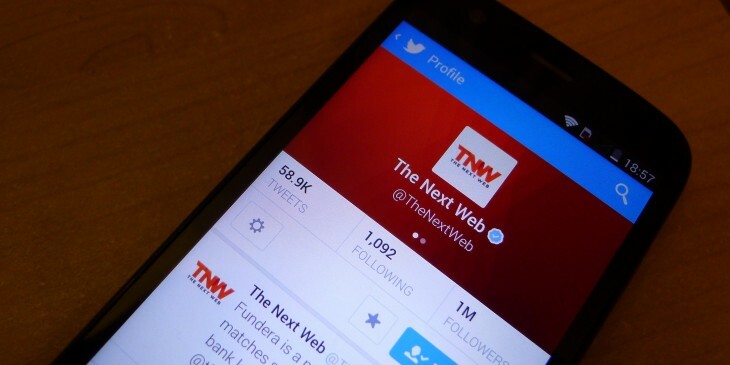 If you’ve managed to jump through those hoops unscathed, you’ve just unlocked one of the best Twitter apps available on the Android platform. The app has its own notification-style menu bar at the top, showing the number of unread direct messages, mentions or tweets in your timeline. They’re beautifully designed and take up very little space, allowing the tweets themselves to take center stage. The animations are gorgeous, with a quick swipe revealing a well-stocked side menu on the left and a shortcut to all of your lists, saved searches, trending topics and starred users on the right. It’s blazing fast and includes an internal browser with improved readability, light and dark themes, custom colors, notification options and more. 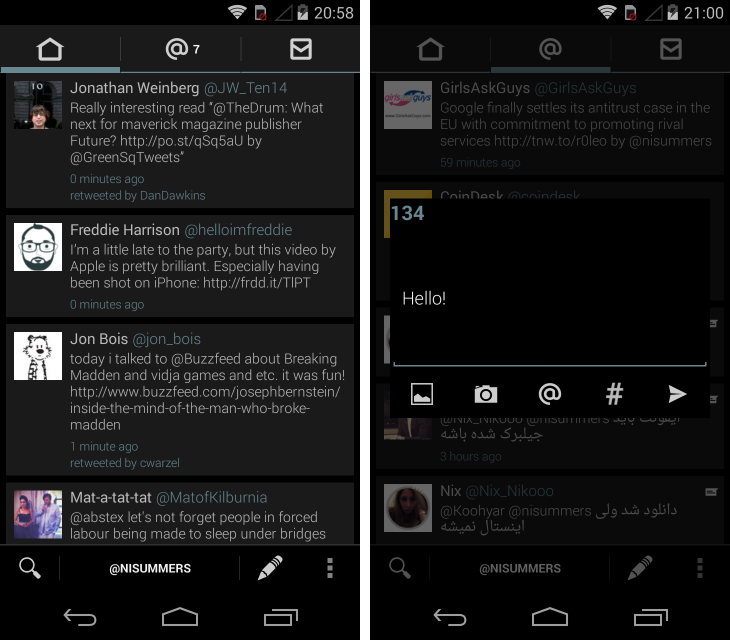 It also integrates with Dashclock, making it one of the best all-round Twitter apps. Tweet Lanes hit its token limit back in November 2012, but it’s worth checking the Google Play store again because, at the time of writing, this excellent third-party Twitter client still has some new tokens to dole out. It has a fresh, original take on the Twitter experience. All outgoing tweets are sent through a ‘Context Box’ which is always present on-screen. Likewise, you can select multiple tweets in your feed with a long-press for a quick message that mentions multiple users. The design pales in comparison to Carbon (see below) and Falcon Pro, but there are some interesting ideas here that go far beyond Twitter’s official Android app. 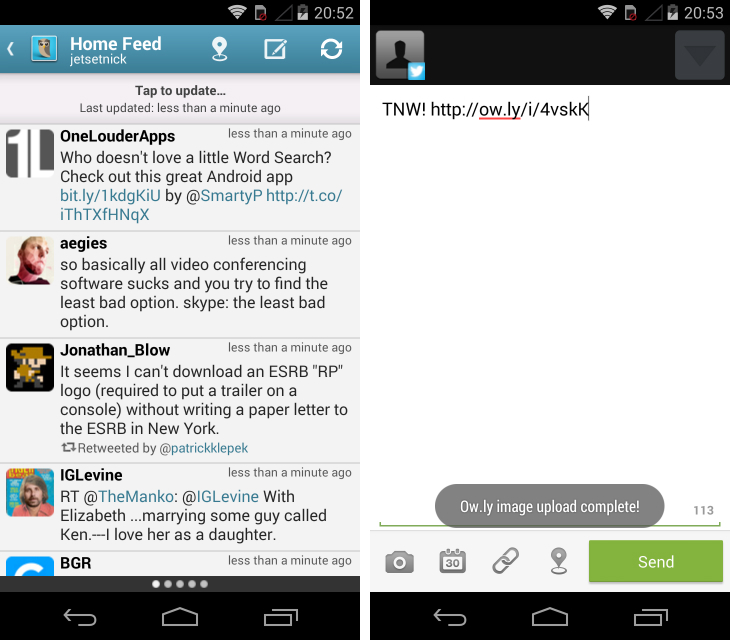 Twidere is about as close as you can get to building your own Twitter app from scratch; at least without writing a single line of code, anyway. From the outset, the app asks you to set the theme, background, colors and typeface, as well as how individual tweets are displayed, including animations, images and text. While the core design is locked in, this level of customization means that it’s easy to tweak the experience to suit your needs and preferences. Once you’ve gone through the initial set up, there are further refinements that you can make in the app’s settings – these include toggling the count for unread tweets, a scroll slider on the side of the screen and the position of the compose button. 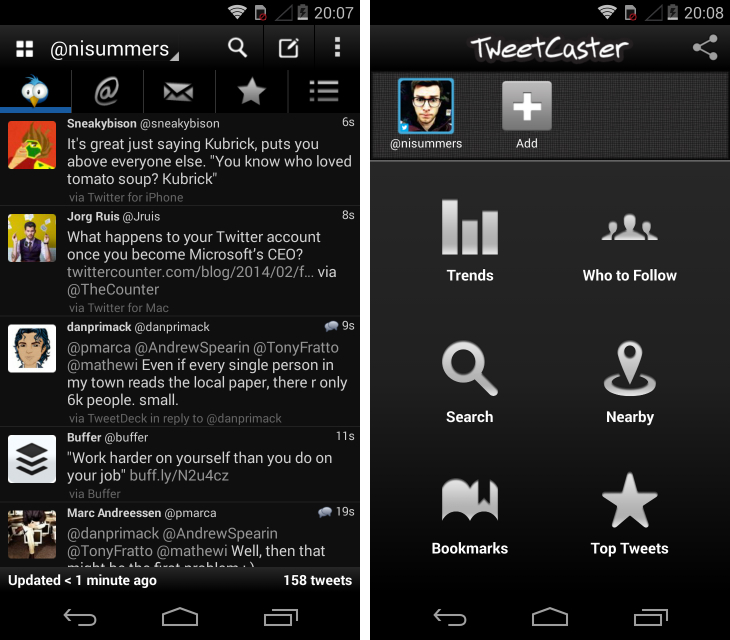 If you ignore all of these options though, Twidere is still a slick and reliable Twitter app for the Android platform. It’s fast and responsive, with a packed side menu and horizontal swipes for quickly moving between feeds. Profile pages look a little bland and there’s no way to see who has retweeted or favorited any of your tweets at the moment. Otherwise, this is another solid contender. 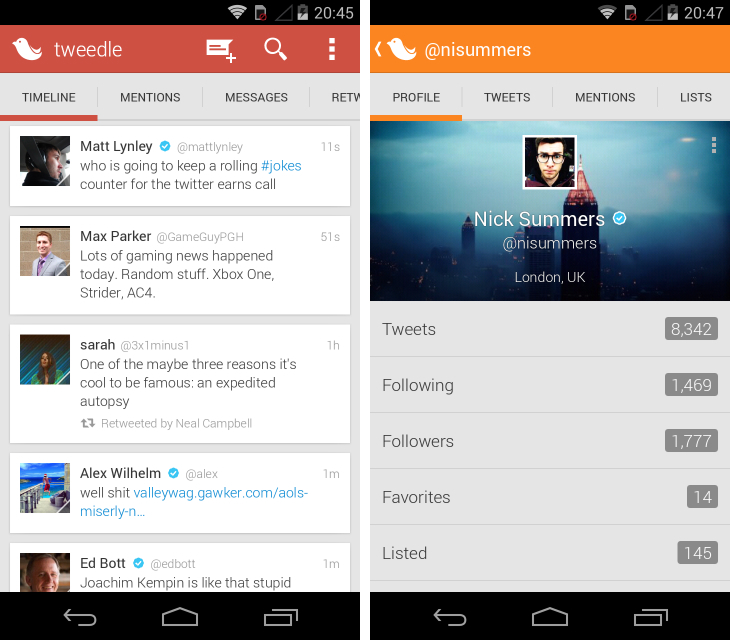 With a $3 price-tag and no free version to speak of, Tweetings is one of the more expensive Android apps on our list. It’s not much in reality (an outstanding Twitter app is arguably worth the price of a Starbucks coffee) but given that many of our alternatives are free, Tweetings certainly has its work cut out. Similar to Twidere, the app stands out by offering an enormous number of customization options that affect its look, feel and functionality. That includes themes (dark and light), the choice of typeface, and the color of tweets that you’ve posted, had favorited or been mentioned in. Personally, I’m not enthused by either theme, but the workaround is to choose the dark theme in conjunction with a transparent background. The effect is fantastic and you can edit the effect to suit the wallpaper on your device. There are portrait and landscape dual-pane options, as well as the option to create new feeds containing almost any content type including retweets, saved searches and specific users. I also love the fact that with streaming enabled, you can set the app so that the feed always shows your most recent tweets, just like it would on a desktop app such as Tweetdeck. For power users, it’s an invaluable way of tracking stories, live events and hash-tags in real-time. Parts of Twicca feel a little dated. Certain icons are in need of a revamp, horizontal swipes for feed navigation aren’t supported and changing certain settings then requires rebooting the app. It’s not bad by any means, but there are other Twitter apps that feel a little more polished and forward-thinking. Yet Twicca has its fans. Each timeline or feed has a dedicated refresh button, which is often faster than the ‘pull to refresh’ gesture implemented in many Android and iOS apps. 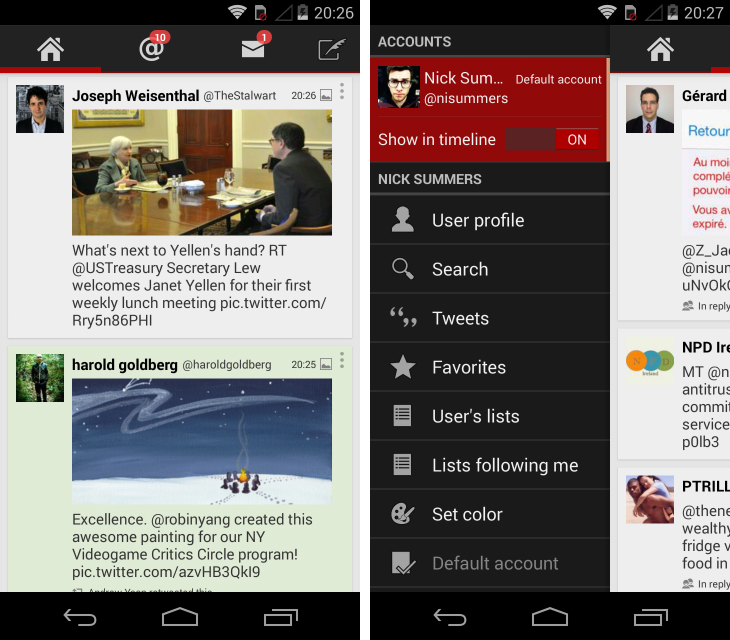 The app is focused and lightweight, avoiding the heavy, bloated interfaces that often plague other Twitter clients. Text can also be set to a microscopic font size, which is ideal for smaller devices and users who want to get the maximum number of tweets on-screen at once. Tweedle makes our shortlist for one simple reason: it has a modern, refined design by default. If you want a Twitter app that looks the part, but doesn’t require changing at least half-a-dozen different customization options, this is the app for you. It’s a simple design, with tabs for your timeline, mentions and direct messages positioned at the top of the screen. Scrolling is buttery smooth and individual tweets are clearly legible, utilising a card design and font that has more than a passing resemblance to Google+. By tapping on one of the headers, you can quickly shoot to the top of your timeline or inbox. A long tap brings up the usual options (reply, retweet, favorite, etc.) and the compose button is clearly visible at the top of the screen. It’s the polish and design details that make this such an outstanding user experience, however. The flat design is excellent and the number of sub-menus and options are kept to a minimum. For those that like to experiment, Tweedle has some extensive options for handling notifications, adding new columns syncing and tweaking the color scheme. Personally, I’m a fan of the red theme copied from the Google Play Movies app (shown above). 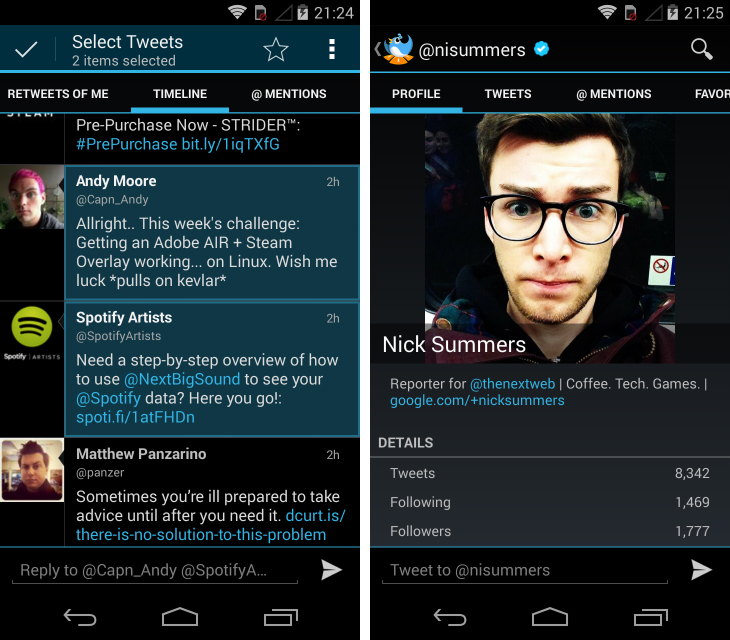 Robird is another Twitter client for Android boasting a minimalistic interface. It’s not the most sophisticated or fully featured app in the Google Play store, but it’s got a slick look and integrates with DashClock. There are a few different themes to choose from and granular settings for tweet streaming, notifications and the information that is shown alongside each tweet. 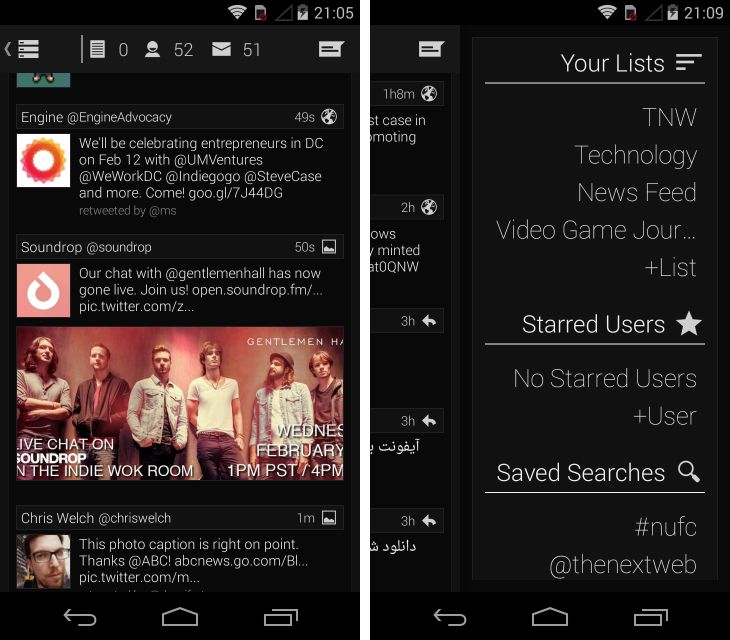 If you’ve been floating between third-party Twitter apps for a while now, Robird is definitely worth checking out. For marketers, social media managers and business owners, Hootsuite needs no introduction. It’s one of the most prolific desktop services for managing accounts from a number of social networks including Facebook, Twitter, LinkedIn and Foursquare. All four of these can be monitored using the firm’s Android app, although it’s also capable as a standalone Twitter client. You can configure which streams are shown in the app and switch between them with a sideways swipe. Hootsuite can be a little slow and unresponsive on Android, and the design – in my opinion – is way behind many dedicated third-party Twitter apps. Even so, if you’re a fan of Hootsuite or want to access multiple social networks from a single app, this is one to consider. 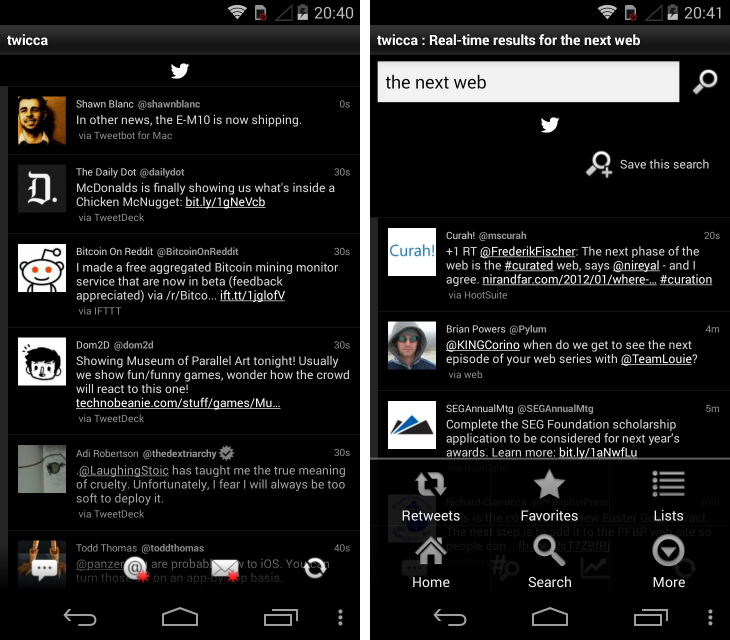 Quite simply, Carbon is my favorite Twitter app on Android. It’s therefore unsurprising to hear that like so many other third-party Twitter clients, its creators have run out of tokens and can no longer accept new users. Technically, it’s still possible to pick up the app provided another user gives up their token, so if you keep checking the Google Play store it might be possible to sneak in. The design is sublime – Carbon is by far the most beautiful Twitter app I’ve used on Android – with a user interface that is refreshing and truly unique. For starters, there are very few icons or visual cues on-screen. When you browse your feeds, there are just three tiny circles positioned at the top which tell you whether you’re viewing your timeline, mentions or direct messages. By tapping your tiny profile picture in the bottom left-hand corner, you’ll find some quick shortcuts to your favorites, lists and retweets, which slide out in a separate column on the right-hand side of the screen. It’s natural, fast and intuitive – if you can grab a token, don’t hesitate to install this terrific alternative to Twitter’s official Android app.